LAKEVIEW — A deal has been reached for the Cubs to move forward with the $500 million renovation of Wrigley Field and development of its surrounding neighborhood. After weeks of negotiations at City Hall, the Cubs, Mayor Rahm Emanuel and Ald. Tom Tunney (44th) agreed to a framework for the plan, which calls for a new video board in left field, 40 night games, six Friday 3:05 p.m. games and street fairs on Sheffield Avenue, the team announced. The Cubs had asked the city to ease restrictions on the 99-year-old ballpark after opting to end requests for public money for the renovations. Tunney refused to agree to support changes unless the team addressed points critical to the community such as parking, traffic and security. The team still is required to go through the regular community approval process for some aspects of the proposal, and it hopes to get final approval by October of this year. U.S. Rep. Mike Quigley (D-Chicago), whose district includes Lakeview, said the agreement "provides the framework to keep Wrigley Field around for another hundred years as the most beautiful ballpark in baseball, while laying the foundation for a World Series win. "The framework will have a lasting positive effect in the Lakeview community, promoting economic growth and creating jobs both in the short and long term, while addressing neighborhood concerns of public safety and traffic," Quigley said. For parking, the team agreed to a plan to provide 1,000 free remote parking spots with a shuttle to Wrigley Field, killing the $6 fee currently charged to park in the remote lot at DeVry University. It also agreed to advertise the free parking more, with help from Tunney and the Chicago Department of Transportation. The "Brown Lot" on Eddy Street, near the Taco Bell on Addison, will be reconstructed, pending community approval, with a maximum of 300 additional spots available to those attending games and patrons of a hotel the Cubs plan to build on the old McDonald's property across Clark Street, according to a Cubs statement. The Cubs will pay for new Clark Street traffic lights in hopes of easing congestion, with part of the money coming from CubFund, an existing account that the team must contribute to each year as part of a deal with the city. In regards to security, the plan includes an additional 30 security guards after games, with the team paying for 10 of them. Another 10 will come from shifting Chicago Police Department forces, and the cost of the last 10 has yet to be determined. Previously, the team pitched an idea to have a taxpayer-backed special service district contribute to security costs. The contentious point of night games ended with the city and Tunney agreeing to raise the limit to 40. The Cubs may also play up to an additional five night games without counting against the limit if Major League Baseball requests the Cubs change a day game to a night game. Any more MLB requests must be authorized by the City Council, and no Saturday or Sunday night games would be scheduled unless MLB requests them. No official cap exists for MLB games as part of the plan the city and the Cubs agreed to. The current ordinance allows for 27 night games with room for three more if MLB asks to change a day game to a night game. Under the agreement, the Cubs would be allowed six 3:05 p.m. games on Fridays and four concerts. The team could host more than four concerts, but each would count against the night-game limit. The current agreement requires that the team receive special permission every time they want to host a concert. Rooftop building owners were not involved in the discussions at City Hall and threatened to go to court if their views were blocked. The city and the team agreed to adding a video screen in the left field and an ad in the style of the existing Toyota ad in the right field. 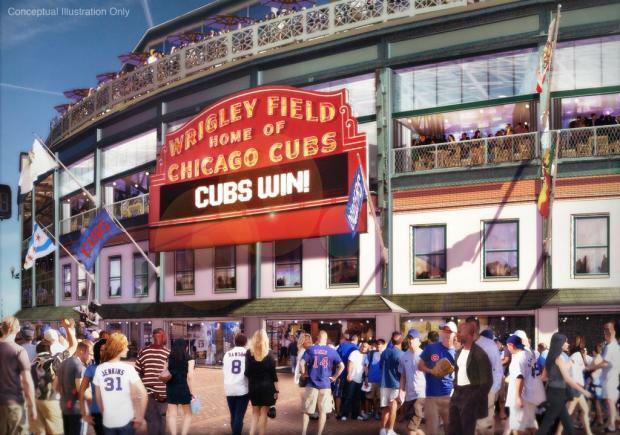 The size of both have yet to be determined, but the Cubs asked for a 6,000-square-feet video board in left field and a 1,000-square-foot ad in right field, according to a Cubs statement. The Cubs would minimize the impact of the new video screen and ad by moving the exterior walls of the ballpark back as much as eight feet — eliminating the parking lane on Waveland and the sidewalk on Sheffield. Whether the team will compensate the city for the space has yet to be determined. A rooftops spokesman had no comment on the proposed video screen and ad. The team also would be allowed to close off Sheffield Avenue for street fairs during weekend home games between Memorial Day and Labor Day, starting two hours before the game and ending by the end of the second inning. After the planned open-air plaza on the so-called Triangle Property on Clark Street is built, the street fairs would be re-evaluated to see if the plaza is more suitable for pregame activities. The Triangle Property also would include an 85-foot-tall building with retail, office and hotel meeting space — with the team hoping alcohol sales will be allowed in the area. The hotel across the street would be 91 feet tall and house 175 rooms and 75 parking spaces, with a pedestrian bridge going over Clark to the plaza. The existing Captain Morgan Club would also be expanded to two stories and cover 14,000-square-feet of space. On the hotel, the open-air plaza and the Captain Morgan building, the team plans to post 35,000-square-feet worth of advertisements. The team does not want any new billboards elsewhere around the ballpark. According to a Cubs statement, the city will "explore protections to prevent ambush marketing in the area around Wrigley Field." Under the team's prior agreement with the city, the Cubs had to put money for community infrastructure into the CubFund annually — some $83,334 in 2004 dollars, adjusted for inflation each year. The fund now has $1.1 million, part of which will go toward stoplights on Clark Street as part of the new deal. Under the new deal, the Cubs would have to pay $500,000 a year from 2014-2018 and $250,000 a year from 2019-2023. The projects would be determined by the alderman and the team. The planned School Street Playlot would get $1 million from the team, with $250,000 coming from 2014's infrastructure contribution. Previously, the Cubs refused to commit a dollar amount to the park until renovation negotiations were completed. The Cubs and Wrigley Field are 95 percent owned by a trust established for the benefit of the family of Joe Ricketts, owner and CEO of DNAinfo.com. Joe Ricketts has no direct involvement in the team's day-to-day operations.